Newport is a residential and industrial suburb 8 km south-west of central Melbourne, immediately north of Williamstown. Apart from the shoreline along the Yarra River, Newport is situated on basalt land. Several quarries were opened up, one in the west of Newport remaining visible into the 1980s. It is now the site of a reserve. The main settlements in the region, however, were Footscray and Williamstown, despite the opening of the railway line in 1859 and Newport being the junction of the lines to Geelong and Williamstown two years later. 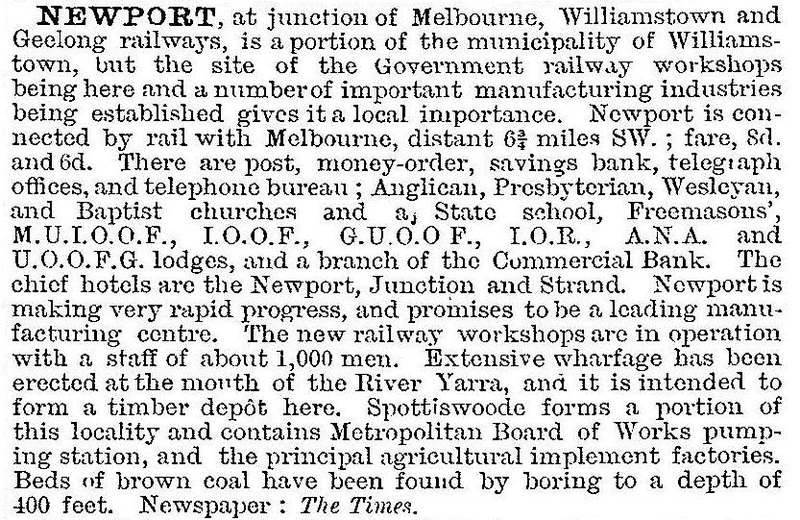 During the mid-1880s the railways workshops were built (replacing those at Williamstown), several subdivisions around the workshops were released, and another line was opened from Newport junction, to Sunshine (1887). Newport’s association with Victoria’s railways was thus established. Proximity to transport attracted a woollen mill and a freezing works. Before then there had been light settlement. The ferry connecting Melbourne to Williamstown berthed at the north end of The Strand at the border of Newport, and a common school had been opened in 1856. It was replaced by a State primary school in 1886. A Catholic primary school opened in 1901 in Newcastle Street, but the civic area was to be one block south in Mason Street with Baptist and Anglican churches (1913, 1914) and a mechanics’ institute (1934). In 1912 the State Government decided to electrify the suburban trains, and the Railways Commissioners built a coal fired electricity power house at Newport next to the river. The power house was later integrated with the State Electricity Commission’s generation plant providing power for both railways and the metropolitan grid. In 1923-24 Newport supplied 68% of Victoria’s electricity. Notwithstanding the postwar growth of generating capacity in the Latrobe Valley, Newport supplied 19% of total Victorian thermal generated electricity in 1961-62. During the 1920s Newport extended westwards into today’s Altona North. An interesting garden city design subdivision was named the Newport Railway Estate Number 2, adjoining Hanson Street. Reputedly designed by Marion Mahony and Walter Burley Griffin, but more likely Saxil Tuxen, its Marion Street suggests the reputed connection. Newport’s shopping centre grew around the railway station, unfortunately congested by Melbourne Road where it obliquely crosses the railway line. A short way out of the shopping centre are the football ground, the Returned Servicemens’ League and the bowling green. Further west of the shopping centre housing development was uncompleted until the postwar years. Newport West primary school (in Newport, not Altona) was opened in 1952. The Victorian Railways workshops, which are on the Victorian Heritage Register, dominated a large part of Newport’s land surface. In the 1970s a more visibly dominant structure in Newport was the exhaust stack for a new electricity power house. The State Electricity Commission began construction of two 500,000 kilowatt natural gas fired stations in 1972. Environmental work bans delayed completion until 1979. In 1984 the stations supplied 12.6% of Victorian electricity, mainly for peak loads. Within ten years, as Latrobe Valley’s capacity further strengthened, Newport supplied 6.6%. In 1992 the railways workshops closed, 106 years after their construction started. They had covered the whole gamut of locomotive, rolling stock and equipment manufacture. There were a dedicated technical school and a printing works for railway timetables, tickets, brochures and books. During World War II the workshops made ornaments and aircraft. A railway line brought workers from Newport to the Gardens station in the workshops, so-named because of the horticultural plantings by Victorian Railways employees. During the late 1980s and 1990s Newport gained a continuous foreshore reserve, from The Strand to the Spotswood museum, provided with cycle paths and sports facilities. The quarry site to the west also became a large reserve with lakes and walking trails. The technical school next to the railways workshops became a TAFE. South of the railway station the large brick substation has been refurbished as an arts centre. Newport also holds the warehouse for the Metropolitan Fire Museum in which a small fire broke out in 2009, however, all vehicles were saved. Newport’s median house price in 1987 was 78% of the median for metropolitan Melbourne. In 1996 it was 96% of the metropolitan median, suggesting that the gentrifying price rises had spread beyond neighbouring Williamstown. According to the census, in 2006 the median income of Newport’s residents was 20% above the Australian median and in 2011 it was 39%. Row houses increased from 8.2% to 20.8% of occupied dwellings during 2001-11. Many of these can be seen in the estate east of the railway line beside the Victorian Railways workshops.